A tutorial video on Akt upstream and downstream signaling mechanisms with information on clinical ramifications of aberrant Akt signaling in disease. A webinar presented by AAAS and sponsored by CST, describing the shift from oxidative phosphorylation to lactate production for energy generation in tumor cells, and presenting research findings in key signaling pathways, oncogenes and tumor suppressors (Akt, mTor, c-myc, and p53) linked to this effect. A 3D rendered animation containing an introduction to the nucleosome, histone code, and euchromatin and heterochromatin states. A tutorial video describing how PTMScan® Technology proteomics can be used to identify and quantify changes in post-translational modifications. A webinar sponsored by AAAS, describing how antibody-based peptide enrichment for a class of PTMs combined with tandem mass spectrometry has been successfully used for global identification of hundreds to thousands of PTMs that can play key roles in cellular signaling. Also presented are examples of how these approaches are being applied to target identification, validation, and biomarker discovery. A 3D rendered animation illustrates caspase-mediated apoptosome formation and activation, from release of cytochrome C by mitochondria to proteolytic degradation of cellular components such as actin filaments. A 3D rendered animation of cytokine receptor complexes and activation featuring the cytokine IL-6, a potent inducer of the acute phase response. A 3D rendered animation featuring protein production from mRNA translation to exocytosis. A step-by-step guide on how to generate iPS cells. This white paper was written in collaboration with Dr. Ryan M. Walsh and Dr. Konrad Hochedlinger of the Harvard Stem Cell Institute. A tutorial video including an overview of embryonic stem cells, their differentiation along lineage-specific pathways, and the epigenetic regulation and marks found in early embryonic development. An application guide that includes protocols, troubleshooting, and data illustrating critical factors for western blotting success. 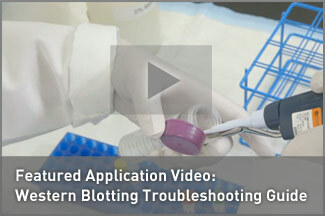 A video highlighting the critical experimental steps in western blotting and explaining how small changes to the protocol can affect the final outcome of your blot. A video providing tips to help you diagnose problems and identify solutions to ensure you get the expected results in the shortest amount of time. An application guide that walks through protocol steps, troubleshooting tips, and data supporting recommendations found throughout the procedure to help improve your IHC analysis. A video seminar discussing best practices for immunohistochemistry using paraffin-embedded samples. Specific IHC examples are clearly discussed to explain how the choice of reagent can impact results and how to perform a thorough validation of antibody specificity for IHC while avoiding erroneous conclusions, particularly when using phospho-specific antibodies. An application guide highlighting important concepts about critical protocol steps, antibody performance, and experimental controls, with examples of supporting data supporting our recommendations for successful immunofluorescence.